I recently came across an amazing, rare video of Tanaquil Le Clercq performing Jerome Robbins’ Afternoon of a Faun with Jacques d’Amboise. I’ve always enjoyed looking at the photographs of Le Clercq that hang on the walls of the NY State Theater during NYCB’s season, such as the above photograph of her in Balanchine’s La Valse. 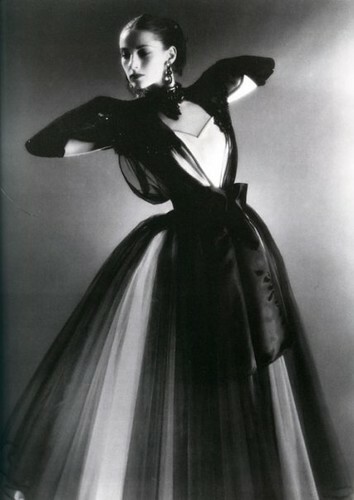 And I’ve read about Le Clercq’s career and marriage to Balanchine (she was his fourth wife). But I’d never seen her dancing until I watched this video. Tanaquil, better known as Tanny, is stunningly beautiful and has incredible technique. I wonder what audiences must have thought in 1953 when they saw Faun, which Robbins created for Le Clercq. How tragic that her career was cut short in 1956 when she contracted polio and was paralyzed from the waist down. She was only 27. Watch the video here. This entry was posted in Balanchine, ballet, Dance, New York City Ballet, Photography, Videos and tagged Afternoon of a Faun, Balanchine, ballet, film, George Balanchine, Jacques d'Amboise, Jerome Robbins, New York City Ballet, Photography, Tanaquil LeClercq. Bookmark the permalink. OMG! She is sooooooooooooo gorgeous! Im doing a research project on George Balanchine so I need pics.